This post preceded Google’s Announcement later this day that sitelinks were here to stay…. See our followup post on Google Announcing Sitelinks Update Permanent. It appears Google is now testing expanded sitelinks extensions for some users and/or websites. In the recent past, Google simply offered a plain text link below a site’s search result to specific “deep” pages within a site. Google attributed these links to sites in a “completely automated” manner using their algorithms. You can read more about sitelinks, how they are attributed to websites and how to control them in Google Webmaster Tools here. This most certainly lengthens the results page and the descriptions and urls are quite truncated making it a bit of a mess. While the supporting data will take time to collect, our gut reaction tells us the number 1 search result on Google for terms where the number 1 result has extensive sitelinks just got a whole lot more important. For this particular client, Google’s “old sitelinks format” took up 200 pixels of vertical space. The “new sitelinks” format for this client takes up 400px of space. 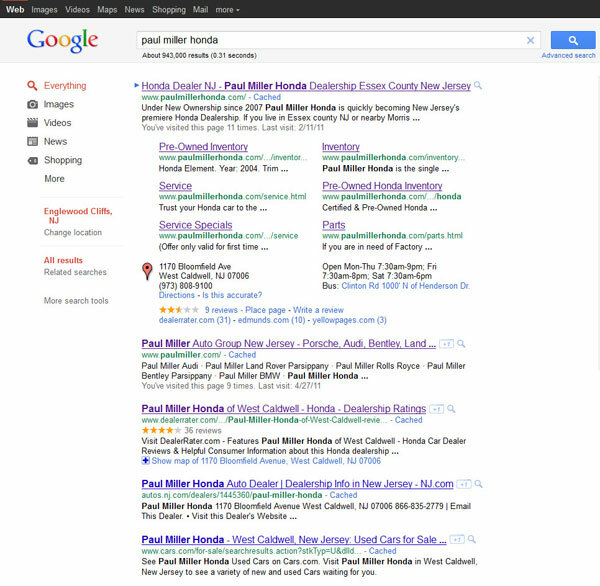 A typical SERP listing with padding on Google with no sitelinks takes up about 100 pixels of vertical space. Therefore, this new format (when combined with a map listing like this client) knocks the next organic listing two spots downs the page. For a branded/vanity search such as this it’s not as big a deal. But try a Google search for “diapers”. or a few other broad keywords which have single word domains as market leaders and you can see the potential effect it has on stifling competition. in our opinion this new format certainly crowds the listings while offering little value. The URLS are truncated as are any descriptions. If there were a “magnifying glass” next to each listing to preview the page and/or perhaps preview the SERP listing in its entirety that would seem to make more sense. Controlling your sitelinks now seems to be more important than ever as well as making sure the first few words in your descriptions are relevant and catchy. We can see the potential here and a page preview feature certainly can make getting users to the right page from jumpstreet a better possibility and lower bounce rates. What are your thoughts? Like or Dislike? How can Google improve sitelinks? This entry was posted in Search Engine Marketing, Search Engine Optimization. Bookmark the permalink.